Chairs, Chair Covers, and Sashes – Everything you need to know! Home » Latest News » Chairs, Chair Covers, and Sashes – Everything you need to know! Here at Solid State UK we stock a HUGE amount of chairs, chair cover styles and colours, and loads of different sashes in multiple different colours and materials! So whatever your event, theme, or colour scheme we have a style of chair for you. We have a wide range of chairs for hire with everything from conference chairs, to bar stools, to outdoor chairs, to wedding thrones. Whatever the occasion, we’ve got a chair to suit it. Along with the variety of different chairs we have available, some also come in different colours to suit any theme. Our banquet chairs are available with blue, red, and cream seating pads and our chivari chairs also come in white, lime wash, and Ice (clear). And even if we don’t have the colour of chair you’re looking for we also have chair covers available in over 30 different styles and colours to ensure we have a chair to suit your needs. 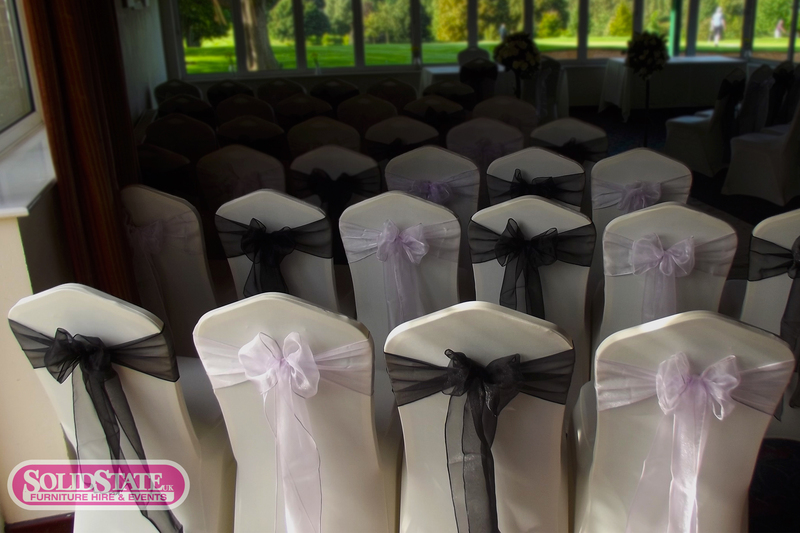 Our chair covers are available in a wide array of colours as well as in different styles! Our Spandex chair covers are undoubtedly a customer favourite due to having the most variety of colours to choose from as well as them being able to comfortably stretch over most chairs! However we also stock cotton, polyester, glitter, ruched ruffle, rosette, and swag chair cover types so whatever you’re looking for we have it covered! 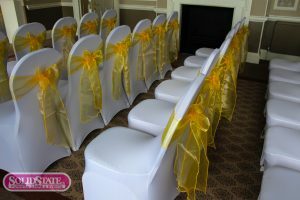 All of our chair covers and sashes are also available for both personal collection and fitting or we can fit them for you to make your day a little less manic. Here at SSUK we stock over 200 different types of sashes in almost any colour you can imagine and in 3 different materials. Our sashes are available in organza, taffeta, and satin materials. So that you can pick the perfect colour and material to match your chair/chair cover! Why not take a look at some of our chairs, chaircovers, and sashes in use below!